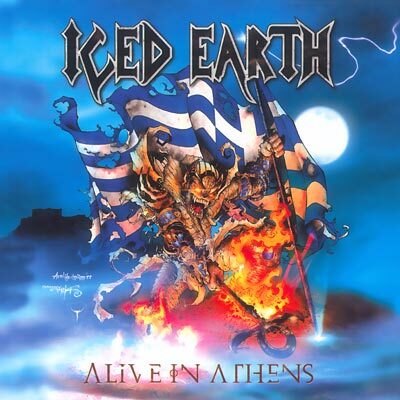 Alive in Athens was recorded on the nights of January 23rd and January 24th in Athens, Greece. Iced Earth was the only band who played at the Rodon Club those nights, and they performed in front of sold-out crowds (of approximately 2000 people) both nights. Iced Earth did not want to make a standard, run-of-the-mill live album; they wanted to make something truly special for the fans to own. Thus, they played two vastly different sets each night, as part of a plan to release a live package with the majority of their catalog on it. The finished product will be a three CD set, containing at least three hours of music. For those interested in vinyl, there will be a five-disc boxed set available. In the U.S., a shortened two CD version will be sold in stores due to cost restrictions. However, the full three CD version will still be available through Century Media mailorder. The band recommends all fans who want the original and complete version to order it rather than buying the two CD version. Recorded at The Rodon in Athens, Greece on January 23rd and 24th, 1999. Produced by Jon Schaffer and Jim Morris. Mixed at Morrisound Studios, Tampa Florida. Artwork by Axel Hermann, Danny Miki, and Travis Smith. Iced Earth logo designed by Jon Schaffer.